Home Leadership How to achieve results by delegating effectively? Sam recently got promoted as the manager for his team after his tremendous performance year after year as an individual performer. In his new role as a manager, Sam finds himself struggling to get work done. In his previous role, his scope of work was the tasks that he had to complete. Today, he is accountable for the tasks that his team has to do. He finds the number of tasks to handle too overwhelming and he has no idea how to go about dividing these tasks among his people. With time, growth and added responsibilities professionals are faced with a scenario where there is cartloads of work to be done. A very common occurrence in large organizations is where a splendid individual performer is promoted to lead a team. While this decision itself is questionable, this puts the individual in question in a tight spot. On one hand is the aspiration where the promotion was a dream and on the other is the burden to lead your entire team to success. What made the person successful so far is no longer scalable. There is simply way too much at hand than one individual can finish on his own. This is where many managers and leaders face trouble. Before we get into how can you effectively delegate, let us talk about the barriers that stop people from the delegation. While there are other barriers which come from team members, we will only discuss the barriers from the leader himself for this post. Losing Control: It feels scary to let others do a task for which you are responsible. You think you can do it better than your team member and are worried that the team member could do it incorrectly. Not getting credit: A lot of people are of the opinion that the way to get kudos is when people appreciate you directly. Not enough time: Another common reason where people feel that it would take a long time to explain the details of the task. It looks easier to do the task yourself than spend time to instruct another team member to do the same task. The first hurdle to overcome for effective delegation is to convince your mind to come out of these 3 major barriers. Most people who struggle with delegation fail to come out of the mindset of a strong individual performer. Once this hurdle is overcome, the rest becomes relatively easy. If not, the rest of this post adds no value. Here is a simple segregation of what you should delegate and how you should do it. 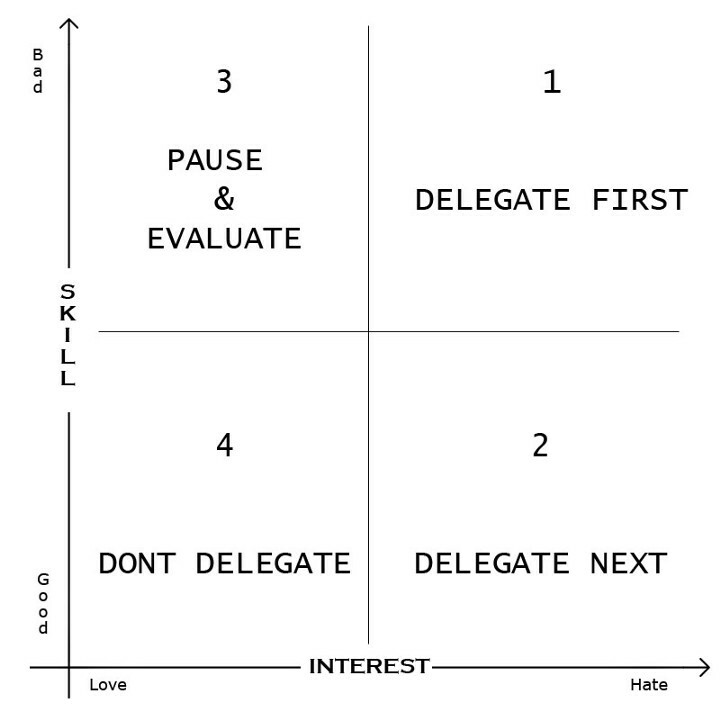 These are also called as the 4 quadrants of delegation. Quadrant 1: You hate these and you are bad at these. Delegate First. This is a no-brainer. If you are doing many of such tasks you are simply a control freak (one exception could be you find nobody who is interested or capable of doing these tasks). By hanging on to them, you are making things worse for yourself and your team. The sooner you delegate them, the better. Long story short, irrespective of the reason the tasks in these quadrants must be delegated. As a leader, your first target is to make sure that you are spending your time effectively before you plan your team. Quadrant 2: You hate these but are good at these. Delegate Next. As hard as it may sound, Yes, you must delegate these too. These drain you and keep you from doing the best work. Also, you should target to have other team members also get good at what you are good at. You may not always have the time to work on every single task that pops up. It is a hard decision to delegate such tasks, but once you do it, it provides you the relief that cannot be explained. When you look back at the past you will love the decision that you made to delegate this quadrant. Quadrant 3: You love these but are bad at these. Pause and Evaluate. These are the tasks that are tough. You love doing them, but you aren’t particularly good at them. The question is whether or not you could become competent with the right training. Regardless, you should decide to get good or get out. If you believe that learning such tasks can help you overall, in the long run, it is acceptable to spend about 10–15% of your time on this. However be wary of spending more time than necessary, especially if you are a person who likes to learn. Quadrant 4: You love these and are good at these. Don’t Delegate(but hold on before you take this as a rule of thumb). These are your highest payoff activities — both for you and your organization. This is where you experience the most satisfaction and make the greatest contribution. You want to do more of these kinds of activities. Ideally, you can do these yourself. However, do keep an eye on how much of an effort is it to get these done and is it inline with the organizational goals. Ask yourself the question if you could spend the same time doing something more productive. Another question to answer is if this expertise is passed on to other team members how will the team benefit. Figure out the cost involved(both time and money) if you continue doing these tasks yourself. There is no right answer for this quadrant. The only advice would be to improvise. Delegation takes time and effort to get used to. Once a task is delegated, strike a balance between micromanagement and being completely carefree. If you have delegated an important task to a direct report, make sure you keep a tab on it to ensure it’s completion. This isn’t to say that you stay right behind the shoulders of the assignee giving him an impression of lack of trust. Just be patient as well as prudent. Losing Control: Keep an eye on how things are progressing if that gives you a satisfaction. It is also a wonderful feeling to see people succeed under you. Not getting credit: If one of your direct reports receives an appreciation, it is a bigger appreciation for you. Gone are the days where you are appreciated for your own work. Leaders are measured by how effective their team members are and not only by the tasks are done by the leader himself. Delegation is one aspect which separates successful leaders from the average ones. The advantages of effective delegation are very many. It saves time, increases productivity, develops trust and team spirit, improves the potential of the entire team to state a few. If you are leading a team and struggling with a delegation, it should be one of the most primary problems that you must aim to solve. Being in Sam’s shoes is common and happens every day. If you are just like Sam, start with tuning your mindset. Realize that as a team you can achieve more than what any individual can. There can be no better advice than that. The sooner a manager comes out of the individual contributor mindset, the faster will the team start reaping benefits. Previous articleDoes your job seem repetitive and boring (hint: Monkey Paradigm)? Next articleHow to make a choice when you have too many options?